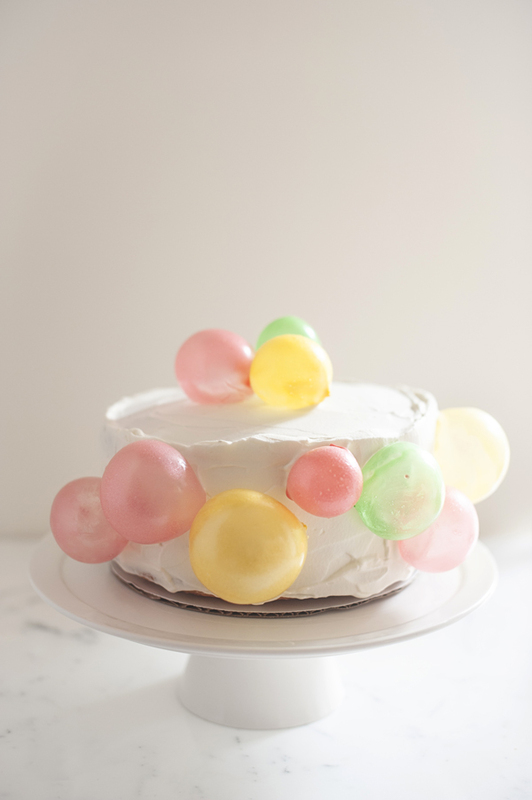 Celebrate a special cake worthy day with a balloon birthday cake. 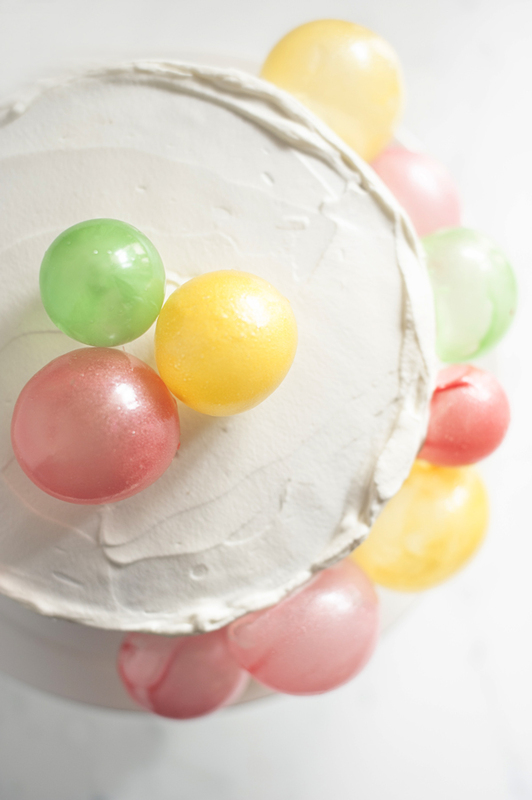 Made with edible balloon bubbles, this cake will be a hit at the next party on your list. In case you have a New Year’s resolution to throw more awesome parties, or be more awesome in general. You can check that off your list with this cake! How special will your guest of honor feel with a cake filled with balloons that they can actually eat (no helium included:). I love the festive and fun vibe this cake gives – it will set a fabulous party mood for any space at any time. We are always on the look out for simple ideas that will make party sweets more special, filing a cake with balloons does just that. The balloon bubbles are basic to make. They can be designed in any color scheme, made big or small, and will instantly bring your party cake to life. 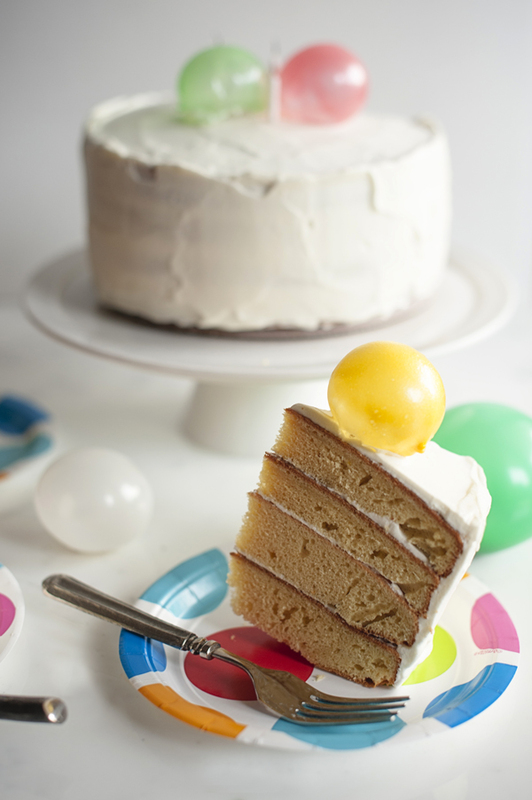 To make the cake you’ll need; 1 batch of our vanilla cake recipe, enough for two layers), 1 batch of homemade cake frosting. 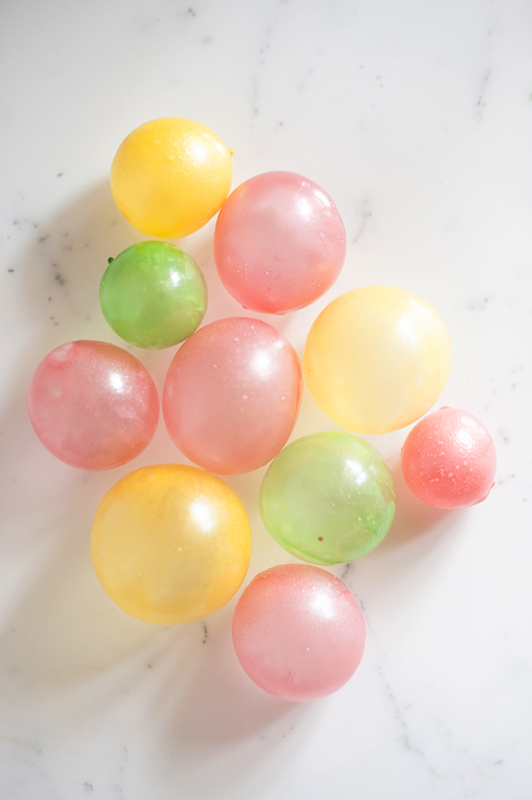 For the balloon bubbles you’ll need; small balloons, powdered gelatin (1 to 2 packages per color), food coloring (we used red, green, and yellow), pearl luster dust (we used gold and green, but white or silver would work with most colors), cold water (2 tbsp per package of gelatin), vegetable shortening, and a small brush. Bake cake. One batch generally yields two 8″ or 9″ layers, which is fine for this project. 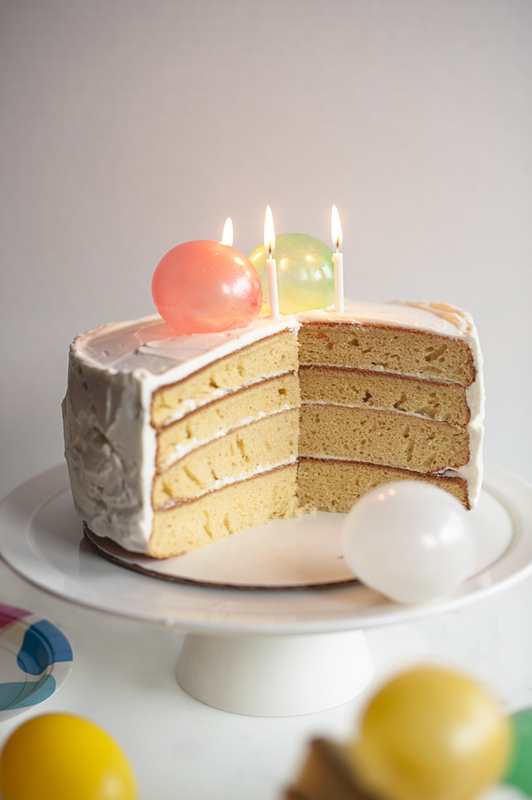 We made 2 batches, or four 9″ layers, to create a taller cake and highlight the bubble decorations. 1. Inflate balloons, filling them about 1/3 to 1/4 with air. Vary the sizes. Tie the open end, pinch the other end, then tie the two ends together to create a rounder shape. 2. 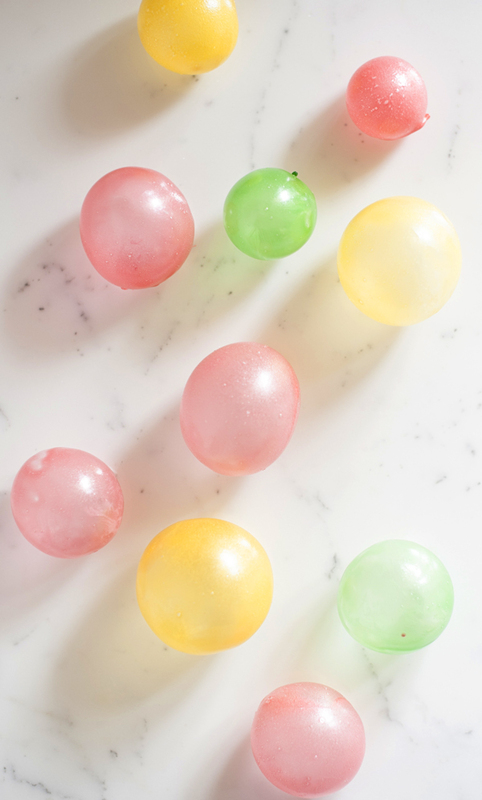 Coat the balloons with vegetable shortening, applying with a brush first and then using your fingers to cover the surface with a thin layer of shortening. Wipe off any excess. 3. Combine gelatin, food coloring, luster dust, and cold water in a microwave-safe bowl. Mix well with a spoon; the mixture will thicken immediately. Let stand for 5 minutes. If using 1 packet of gelatin, add 1 drop of food coloring, 1/8 tsp of luster dust, and 2 tbsp water. This is enough for about 4-6 balloons, depending on the sizes. For 2 packets of gelatin, add 2 drops of food coloring, heaping 1/8 tsp of luster dust or more, and 4 tbsp water. This is enough for about 8-10 balloons, depending on the sizes of the balloons. 4. Heat the gelatin mixture in the microwave for about 10 seconds. When it is lukewarm, hold a balloon by the knot and dip it into the gelatin. Rotate it, coating the bottom and sides, avoiding the knot. Allow excess to drip back into bowl. Lay balloon knot-side down on a wire rack. Let dry 5-10 minutes. Repeat with remaining balloons. Re-dip balloons if you wish them to be darker in color. If using other colors, repeat steps 3-4. 5. Allow balloons to completely dry on rack over a 24-hour period. The gelatin will harden to a thin, crisp shell. After the surface of the balloons have dried, remove the balloons. Snip off a small area near the knot of a balloon to let the air escape. The balloon will pull away from the sides of the gelatin. 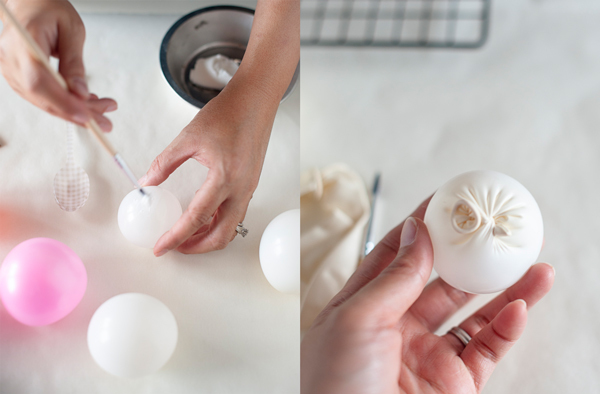 Make a small opening near the knot to gently remove the balloon, leaving the gelatin shell, or bubble behind. 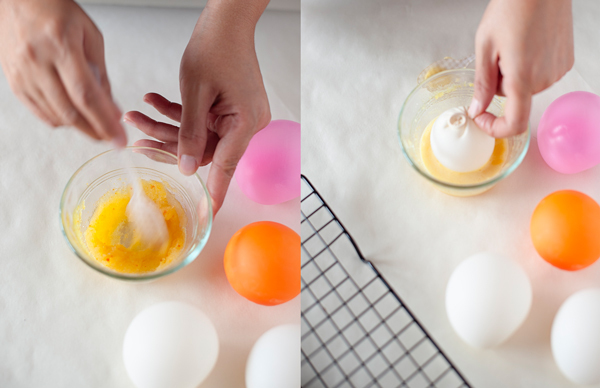 Frost your cake as you normally would (a messy cake is a great look with these balloons). 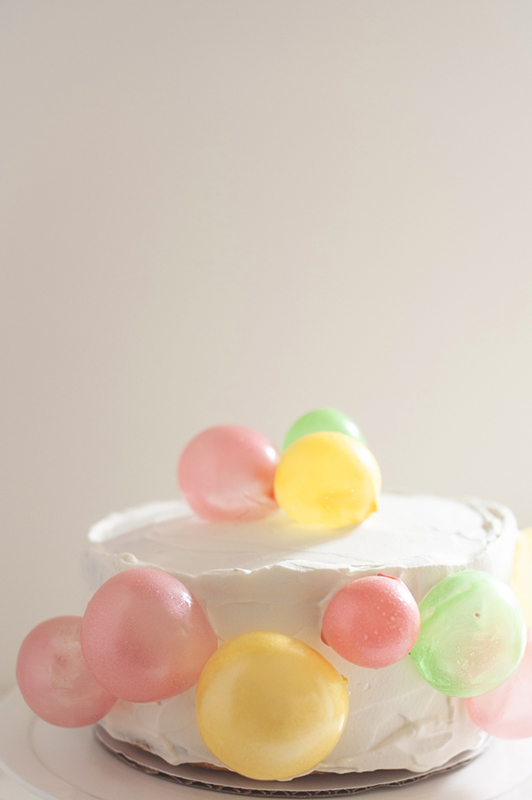 Decorate cake by applying bubble balloons, cut-side down, to the frosting — they should stick with gentle pressure. 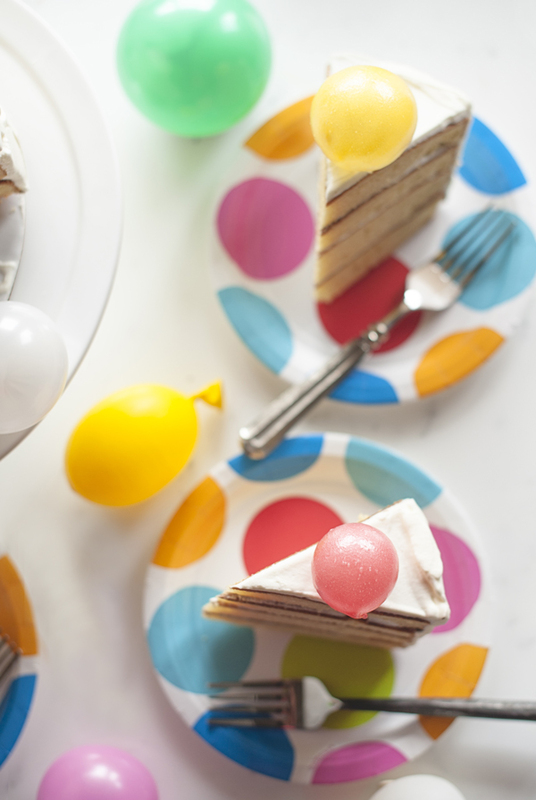 Serve a balloon with each slice of cake and enjoy the praise that comes with being an awesome party hostess this year. Awesome job!! Thank you for this wonderful tutorial! My daughter wants a bubble cake for her birthday and this is a perfect idea!! In love with this idea! Its a must make for a party cake. My kids would go nuts for this! Thanks for the inspiration. These are so cute! They would make a great cake decoration for a baby shower I am organizing! I made these two days ago testing then out before my daughters actual birthday. I followed the steps, unflavored Knox gelatin, americolor gel food dye, and pearl edible luster dust from global sugar art, I did what it said to, the next day when I popped them and added to the cake they were very adorable and loved how it turned out! BUT!!! They were not edible at all! My husband, daughter, and myself tried them and spit it out, they tasted like plastic couldn’t even chew, they retained their shape even after being chewed on. This is definitely NOT edible! But are very adorable decorations which I will still use for her final birthday cake but will remove before serving. How fatr in advance can l make the edible balloons and how do you store them ?